The Solar Trade Association (STA) has published a simple and clear checklist to give managers in commerce and industry the confidence to put solar on their roofs. Commercial and industrial roofs dominate the solar market in Europe, but in the UK commercial roofs account for only five per cent of all solar deployment to date. However, as part of DECC’s 2014 Solar PV Strategy, the emphasis is now changing significantly towards boosting rooftop installations and the STA and its members are working closely with government to help unlock the huge potential across the UK. The small commercial roofs sub-market (50kW-250kW) is growing steadily but slowly, with 170MW installed in total across 1,200 installations. One of the limiting factors to the market is commercial awareness and confidence from rooftop owners who need reliable guidance. The government focus on this sector and the STA work to support, identify and break down barriers, is now showing signs of significant growth in this market: the first quarter of 2015 saw deployment double compared to the first quarter of 2014. However, the latest DECC data shows there are only 70 larger-scale (250kW+) solar roofs installed across the UK, and this is where more focus and support is required to tackle the limited deployment. More high profile schemes like the Jaguar Land Rover and BMW car factory roofs are needed. The checklist, which can be downloaded from the STA website, is applicable to all size of commercial rooftop installation from schools and small businesses to large supermarkets and factories. 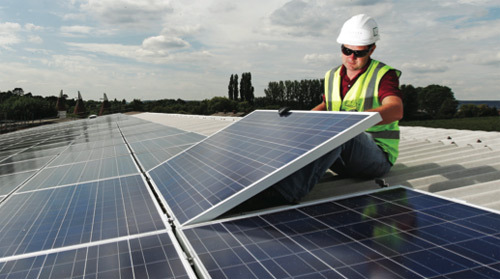 Solar has been installed on a huge range of structures across the UK including bridges, airports, city skyscrapers, railway station roofs, car parks and even motorway sound barriers. Solar can also be integrated in to buildings, embedded in glass as windows, and also included as a vertical building facade. The STA has previously identified administrative barriers to the incorporation of solar power on commercial premises. Government is acting to remove several of these, including permitted development rights for solar up to 1MW (meaning it will not need planning permission) and the ability to shift rooftop schemes if companies move premises.